US Army Corp of Engineers needed pallet rack for their VSE location. 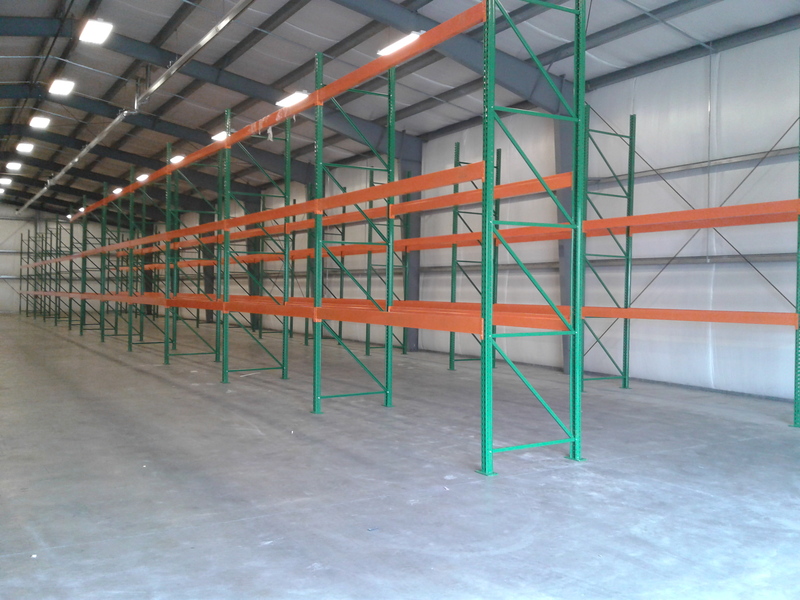 NationWide Shelving came up with the solution of Pallet Rack to suit US Army Corps of Engineer’s needs. Pallet Rack stands upright and can use vertical space instead of floor space. Pallet rack allows you to use stacking methods of storage. Pallet Rack can use vertical methods of storage, saving you floor space. With its practicality and inexpensive cost, pallet rack is a great choice for industrial storage. Pallet Rack is a form of industrial storage that uses pallets to hold supplies. There are many kinds of pallet rack, but each kind has one job: to store palletized material in horizontal rows with multiple levels. The bolt together design of our pallet rack brings overall costs down over time because parts can easily be replaced. Other types of pallet rack require you to replace the entire upright if damaged during use, but our design keeps things simple and less costly by letting you replace individual parts. The beams of our pallet racks feature safety clips that allow easy replacement in case of damage, saving you time and hassle. Our pallet racks are designed for use with forklifts or for heavy duty hand stacking, and you can buy uprights as either K.D. or assembled. There are many factors that go into choosing the correct size of your unit. You can choose between regular duty 16-gauge steel for lighter-weight storage, or our 14-gauge steel for heavier storage duties. In our regular duty 16- gauge steel uprights, we offer heights of 8”, 10”, or 12” or depths of either 3” 3.5” or 4”. Our 16-gauge steel uprights feature 16,000 lbs capacity per upright. Our heavy duty 14- gauge steel uprights offer heights of 10”, 12”, 15”, or 16”, with depths of 3”, 3.5”, or 4”. Our 14-gauge steel features a 23,000 lb capacity. Our Step Load Beams come in heights of 3.5”, 4”, 5”, and 6”, with lengths of 8”, 9”, 10”, or 12”. Uprights have a 3” x 3” standard column design and a 5” x 8 “ base plate with a bolt together design for easy replacement in case of damage. Our beams can be adjusted every 2”, giving you much freedom to choose the amount of space on each level. Our uprights come in an easily visible light green color, and can be shipped to you assembled for an additional charge. Our step load beams come in an easily visible orange color and are interchangeable with most major pallet rack manufacturers. Two beams are needed to make a shelf, and beam capacities are based on an evenly distributed load. There are also additional accessories for Pallet Rack, including wire mesh decking, steel safety supports, frame guards, bay dividers, and label holders. Our wire mesh decking is an open wire construction that reduces dust build up and allows free light and air circulation. It has the ability to increase sprinkler effectiveness and improve visibility. Our steel safety supports can be used as front to back members to support pallet or wood decking, and can be used in conjunction with wood decking to provide additional support for hand stacking applications. Our frame guards can help you to avoid damage to valuable rack columns by withstanding impacts with its solid steel guard and heavy duty construction. Our frame guards come in a highly visible yellow color with 4 mounting holes. Our bay dividers help you organize material vertically with dividers. They’re designed to fit over Step Load Beams and are easy to install. The pre-punched holes in our bay dividers give you the ability to permanently mount them. Our label holders are self- adhesive and magnetic to allow simple label relocation. Designed extra large for Pallet Rack application, they also include Ink Jet/Laser compatible white inserts with instructions. Various dimensions, specs, capacities, and colors are available for each of our accessories. Pallet Racks can save you time and space as well as improve productivity making your day easier.